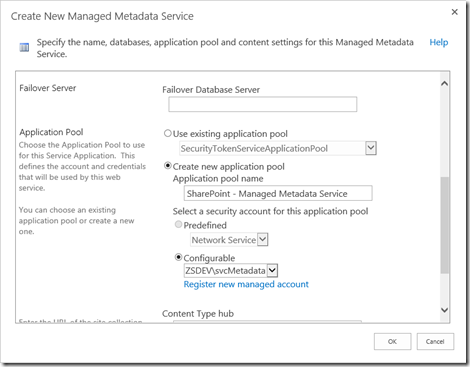 In this post I will tell you how to configure Managed Metadata Service Application on SharePoint Farm. The Managed Metadata’s primary purpose is to provide you with a central location to store metadata (commonly defined as data about data) that can be utilised throughout any site within your SharePoint farm. Here we start configuration of metadata server. 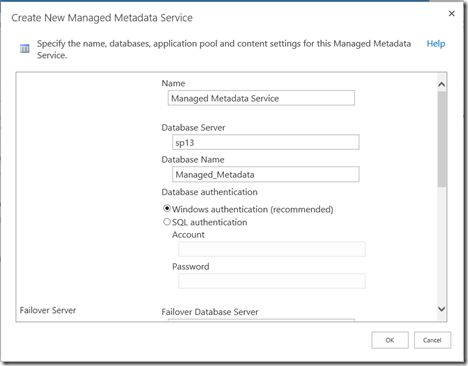 1) Open Central Administration, Go to Application Management >> Manage Service Application >> Click on New >> Select Managed Metadata Service. You can give name to service whatever you want, I’ve given “Managed Metadata Service” for more clarity. and Database name as Managed_Metadata. I’ve used svcMetadata service account for Application Pool Identity. Once the service is created you can see it listed on Managed Service Application Page. 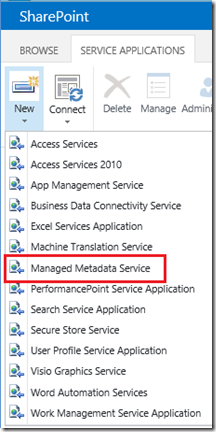 Now we need to start Metadata Service from SharePoint Services on Server page. for that go to Central Panel >> Under System Settings >> Manage Services on the server. This will launch the below screen which is referred to as the Term Management Tool. Office Web Apps is the online companion to Office Word, Excel, PowerPoint, and OneNote applications. It enables users, regardless of location, to view and edit documents. Office Web Apps gives users a browser-based viewing and editing experience by providing a representation of an Office document in the browser. When a user selects an Office document that is stored in a SharePoint document library or on SkyDrive, the document opens directly in the browser. The document appears in the browser similar to how it appears in the Office client application and provides many of the same editing features. When an Office Web App user selects the Edit in Word, Edit in Excel, Edit in PowerPoint, or Edit in OneNote button on the toolbar, the document opens in the associated Office client application if it is installed on the client computer. Office Web Apps Server is an Office server product that provides browser-based file viewing and editing services for Office files. Office Web Apps Server works with products and services that support WOPI, the Web app Open Platform Interface protocol. These products, known as hosts, include SharePoint 2013, Lync Server 2013, and Exchange Server 2013. An Office Web Apps Server farm can provide Office services to multiple on-premises hosts, and you can scale out the farm from one server to multiple servers as your organization’s needs grow. Although Office Web Apps Server requires dedicated servers that run no other server applications, you can install Office Web Apps Server on virtual machine instances instead. It is easier to deploy and manage Office Web Apps within your organization now that it is a stand-alone product. If you deploy SharePoint 2013, for example, you no longer must optimize the SharePoint infrastructure to support Office Web Apps, which in earlier versions was tightly integrated with SharePoint Server 2010. You can also apply updates to the Office Web Apps Server farm separately and at a different frequency than you update SharePoint, Exchange, or Lync Server. Having a stand-alone Office Web Apps Server farm also means that users can view or edit Office files that are stored outside SharePoint Server, such as those in shared folders or other websites. This functionality is provided by a feature known as Online Viewers. When used with SharePoint Server 2013, Office Web Apps Server provides updated versions of Word Web App, Excel Web App, PowerPoint Web App, and OneNote Web App. Users can view and, in some cases, edit Office documents in SharePoint libraries by using a supported web browser on computers and on many mobile devices, such as Windows Phones, iPhones, iPads, and Windows 8 tablets. Among the many new features in Office Web Apps, improved touch support and editing capabilities enable users of iPads and Windows 8 tablets to enjoy editing and viewing Office documents directly from their devices. The following illustration summarizes the viewing and editing capabilities of Office Web Apps on SharePoint 2013. 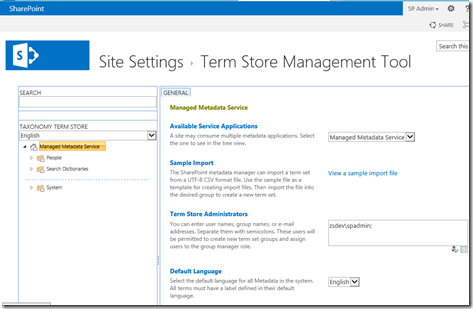 What is new in Office Web Apps? Change tracking Enables users to open Word files that contain revision marks in a Word Web App. Comments Users can view, add, and reply to comments in a Word Web App and PowerPoint Web App. Co-authoring Co-authoring support is new in Word Web App and PowerPoint Web App. It continues to be supported in Excel Web App and OneNote Web App. Embedding Support for embedding Web Apps in websites is new in Word Web App, Excel Web App, and PowerPoint Web App. Ink support Enables users to view Word Web App and OneNote Web App files that contain ink. Installation Office Web Apps is not installed on the same servers that run SharePoint 2013. Instead, you deploy one or more physical or virtual servers that run Office Web Apps Server. Then you configure the SharePoint 2013 farm to use the Office Web Apps Server farm to provide Office Web Apps functionality to users who create or open Office files from SharePoint libraries.. Licensing SharePoint 2013 provides new license enforcement that works with Office Web Apps. If you enable SharePoint licensing and then enable Office Web Apps editing, only the users who have the appropriate license can actually edit Office files in a browser. If no Office Web Apps editing licenses are applied for users, only viewing is supported. Quick Preview Displays a preview of item content when a user rests over a search result in SharePoint. Share by link Allows users to send a link to a document to another user and allow the recipient to use Office Web Apps to view the document. Excel Services is technology that enables you to view and interact with a workbook in a browser window similar to how you would use Excel on your computer. Excel uses a built-in calculation engine to connect to external data and render the results of formulas and queries. Excel Services uses server technology to provide similar functionality in a browser window. Excel Services was introduced in Office SharePoint Server 2007. In SharePoint Server 2013, Excel Services is available only in the Enterprise edition. Excel Services technology is available in Office Web Apps Server as Excel Web App, and in SharePoint as Excel Services. Excel Web App and Excel Services in SharePoint have a lot in common, but they are not the same. Both applications enable you to view workbooks in a browser window, and both enable you to interact with and explore data. However, there are certain differences between Excel Web App and Excel Services in SharePoint. Excel Services supports external data connections, data models, and the ability to interact with items that use data models (such as PivotChart reports, PivotTable reports and timeline controls). Excel Web App enables users to view and interact with workbooks, but Excel Web App does not support external data connections or the ability to interact with reports and timeline controls that use data models. Excel Services provides more business intelligence functionality than Excel Web App, but Excel Services does not enable users to create or edit workbooks in a browser window. Excel Services is available only in the Enterprise edition of SharePoint Server 2013. Excel Web App is available in SharePoint Server 2013 and SharePoint Foundation 2013. As in previous versions of SharePoint In SharePoint 2013, you can still add Dataview webparts to your pages using SharePoint designer 2013 but with a an exception that you no longer see a Design View in SharePoint Designer 2013. Adding DataView with Source is still not very clear. I saw a bug when I tried to add a Dataview but it would only show empty data view and not the List\Library list. However, I found a workaround that and was finally able to add a XSLTListView WebPart on a page. In this post we will see the Step-by-Step Tutorial on how to add a DataView in a SharePoint 2013 site page which will be viewed in Browser. 1. 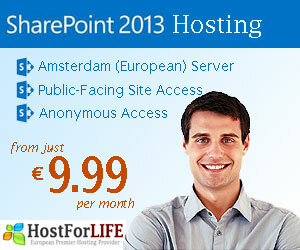 Open your site in SharePoint designer 2013. 2. Next, Create a WebPart Page. Give your Webpart Page a name and click ok.
3. Next Edit file to Open. 5. Next click in of WebPartZone and then click on Insert Tab and then DataView. If you don’t see this and just sees the “Empty Data View” Option select that and then again click in the WebPartZone and then Data View again. Then you will see the datassource Options. The earlier (empty data view) will add a DataFormWebPart that you can delete that if you want. This might be a Bug in SharePoint 2013 beta Designer. Once you add a DataView for a List\Library you will see a new XsltListViewWebPart added. 6. Click on XsltListViewWebPart and you will see the DataView’s tab appear. Here you can Add\Columns,Set Paging,View Data Source details and rules and can do pretty much everything you use to do with your OLD dataview. If you want to edit the XSLT of this webpart you can navigate to “DESIGN” tab and click on “Customize Entire View”. 7. Preview Changes – Even though the Design View is missing you can still preview the changes with “Preview in Browser”. 8. Once done Save the Page and Check in. The below list comprises some of the notable, new features Microsoft has developed for SharePoint 2013. This isn’t really a list for any particular type of user; it’s just a general overview of how Microsoft is adding to the feature set. The list is ranked based on my opinion of relevance and value to the organization. The first feature that will grab everyone’s eye is the new HTML5 view that is best suited for mobile devices. Think of it as a mix between the boring and lifeless classic view from SharePoint 2010 and the new metro look and feel for SharePoint 2013. What you get is a clean and highly compatible UI that should work on just about any device supporting HTML5. A new site feature handles whether or not mobile devices are automatically routed to this view or not, so it couldn’t be easier to deploy for IT pros. Push notifications have become staple features for mobile applications and the devices that support them, so it’s not shocking that Microsoft is now supporting this with SharePoint 2013. This feature requires adoption though from 3rd party developers or internal custom development. The end result is that your device will be able to receive notifications from SharePoint lists and sites. For instance, a new document is uploaded in a library that you’re following, and the notification service sends your device a notification. Simple, yet necessary for today’s mobile devices. This is probably the least impressive new feature, because Microsoft only suggests that “certain kinds” of reports will be viewable on mobile devices. Since we don’t have an RTM build yet, I can’t say really what those reports will be. To further limit the exposure of this new feature, it’s apparently only available for iOS 5 iPads. To even further confuse you, Microsoft says on another page that “PerformancePoint dashboards can now be viewed and interacted with on iPad devices using the Safari web browser.” That seems to suggest that all PP dashboards can be viewed in Safari. Here’s a gem for site managers and devs. You now have the ability to render content for the appropriate device without having to duplicate the content itself. This functionality lets you serve up the same content with multiple master pages, page layouts and style sheets. 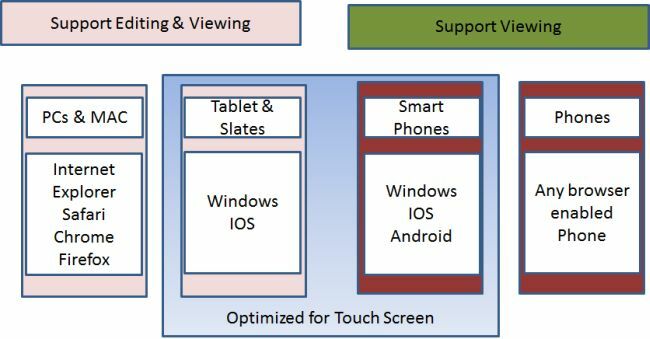 If all goes well, you should be able to support most of the mobile devices in your firm with a lot less overhead than with 2010. The current list of compatible mobile browsers is available on the Microsoft Technet site. Although this is another “under the hood” feature of SharePoint 2013, it should have an interesting effect on using SharePoint with mobile devices in the future. Microsoft has added native support to geolocation fields which can be exposed through Visual Studio. By adding a geolocation field to a list, you can embed coordinates, which can then be rendered with Bing Maps. The obvious benefit here is the ability to use your GPS-enabled mobile device to plot your location in a SharePoint list. Over time, we quickly realize that knowledge can be difficult to find within an organization. Having a dedicated knowledge repository can be very helpful, but the true knowledge in your company usually goes beyond a dedicated place to store articles and documents. SharePoint is great for capturing knowledge through documents, blogs, wikis, discussion boards, social newsfeeds and other content, but this knowledge often gets lost over time, especially as new content is added throughout your environment. How do we harness this knowledge so that it becomes more relevant and useful for the users of your system? One of the key foundations to a good knowledge management system in SharePoint is the definition of content types and managed metadata. This provides a global structure that can be used across your SharePoint environment and provides consistency when searching for information in SharePoint, no matter where your content lives. Using Enterprise Keywords is an easy way for users to tag content with Metadata that doesn’t fit in the structured taxonomy. Using the Managed Metadata Service, these Enterprise Keywords can easily be moved into the formal taxonomy if and when it makes sense. To pull all of this content together, SharePoint Search can be used to return content from across your organization into a single location. The search results page allows users to further refine their results using both your structured and non-structured metadata. A simple example of this may be in finding all training documents related to a particular topic, no matter which department they originated from. Tapping into the knowledge of the people within your organization can provide amazing benefits. Users can complete their SharePoint profile in order to manually add skills and experience that is relevant to their job. SharePoint Search can use this information to return the relevant people for your query. Search in SharePoint 2013 can also determine the relationship between people and the documents they have authored, making it even easier to find the right person with the skills or experience you are looking for without the need for users to keep their profile constantly up to date. SharePoint Search out-of-the-box will provide some ranking of the results based on relevance. With some additional configuration, search can provide very specific ranking for your organization. This may be based on the age of the content, the feedback (ratings) of content received by peers, the source of the content, or even the popularity of the content. With some initial planning and configuration, users can see the true potential in using SharePoint for finding knowledge throughout the organization. This is a Step-by-Step article on how to add Links to the Quick Launch or Left Navigation of a SharePoint 2013 site. 2. When you click on “Edit Links” it Opens the quick launch in Edit mode.You can either drag and drop any link to the edit area or simply click on “link” button. 3. When you Click on the Link you can add the URL where your link would go to and the Text to display.Click OK Once done. 4. This will add “Create Lists” link in the Quick Launch. 5. Save the Quick Launch to Save the settings. Edit the Quick Launch Links – Simply click on the added “Create Lists” link to edit the URL and Text. Order Quick Launch Links – For Ordering the links simply drag and drop the links and Save the settings. Please note : The old “Navigation” option in Site Settings still exists for editing Quick Launch and Global Navigation.The Feature is available Only for sites with Publishing feature turned on.